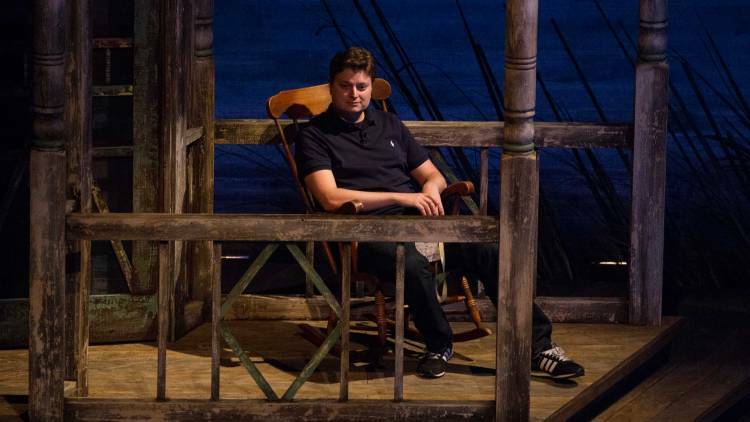 Fletcher Previn / VP of Workplace as a Service at IBM, reclines on set before his session. 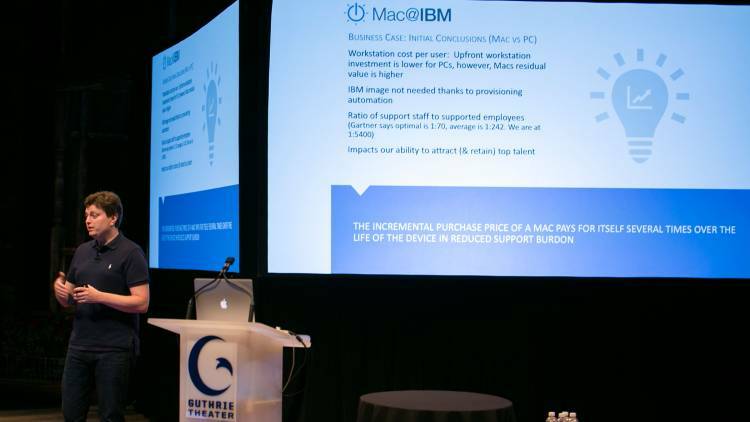 The business case for Mac@IBM: lower costs and higher customer satisfaction. 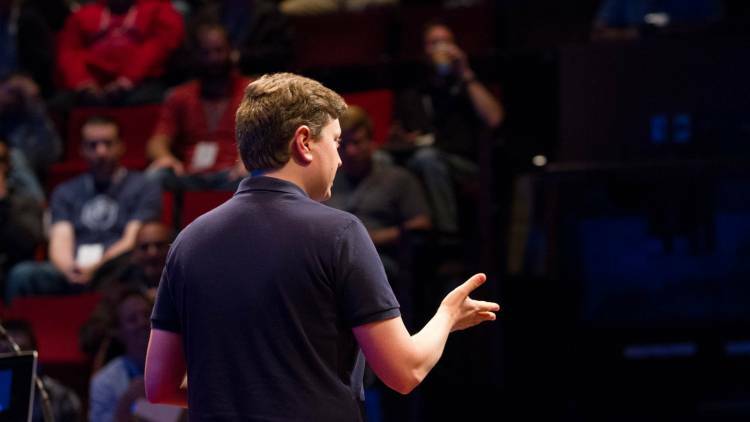 Fletcher Previn during his session at the JAMF Nation User Conference. Fletcher Previn takes questions during his session. Watch this entire video session or catch the highlights. 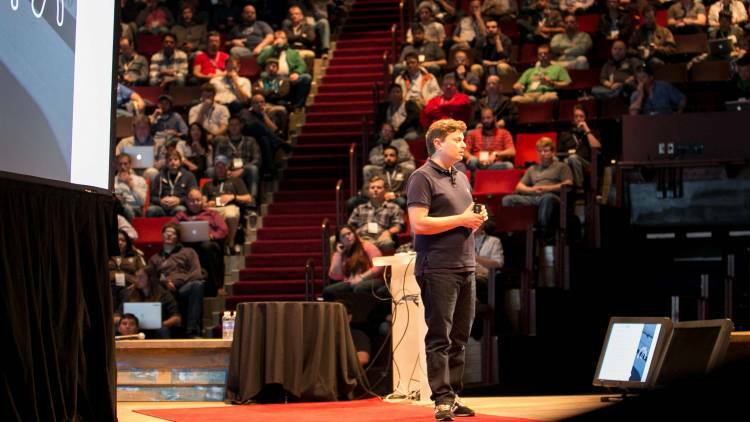 From the moment the session schedule for the JAMF Nation User Conference (JNUC) was announced, the IBM session was a must-see for the 1,000+ Apple IT admins in attendance. Fletcher Previn, VP of Workplace-as-a-Service and the man responsible for delivering a productive IT environment to IBM's worldwide employees, addressed a passionate crowd on how IBM transformed a 500,000+ person Windows-centric organization to support the Apple platform. He said that at IBM, there had always been a lot of demand from employees who wanted to use Mac, but the status quo thinking was that Mac was more expensive, Macs are challenging to support, and they would have to re-train the help desk staff. After meeting with Apple, IBM began to realize that the two companies were very similar: large organizations with a global reach, and were experiencing the same enterprise problems. During their meeting, they also noticed that Apple was managing a large number of devices with significantly less resources than you would typically find in PC environments. Once the decision was made to support the Apple platform, Previn says the plan was to manage the Macs in a way that was typically reserved for mobile devices. With a goal of driving self-sufficiency and simplifying the environment so users could help themselves instead of solely relying on their help desk. When they officially opened the door to their employee-choice program and began offering Mac on June 1st, the hope was to “maintain that Mac buddy experience in the enterprise enroll experience,” said Previn. Through Apple’s Device Enrollment Program and the Casper Suite, IBM’s IT staff is able to hand employees a shrink-wrapped Mac that is immediately ready for use. They also use an enrollment process where Casper Suite Self Service is displayed once the user gets to the desktop. This allows them to configure their own device and add IT-approved apps, software, and configurations. “We do use Self Service as the one and only way that software is distributed to our Macs,” he said. “Managing laptops more the way you’d expect mobile devices to be managed and that’s what Self Service really gives us,” he added. If you need Microsoft Office, you just click install. IT handles the licensing on the back end, but does not expose this step to the user. With a lot of users moving from PC to Mac, Previn congratulated his team for doing a great job of focusing on the user experience and making the migration process extremely intuitive so employees felt comfortable and maintained high productivity levels throughout the process. He also mentioned that IBM does not have an image for OS X, so that they can mirror the consumer box-opening experience for their users. To much fanfare from the crowd, Previn said that IBM is deploying 1,900 Macs per week and currently have 130,000 Macs and iOS devices in the hands of users. And all of these devices are supported by a total of 24 help desk staff members, meaning that each staff member effectively supports 5,375 employees. One stat that particularly stood out was that 5% of Mac users call the help desk, compared to 40% of PC users. This shows how simple it is for the staff at IBM to use the Mac platform, and reflects the hard work the team has done to make the experience seamless. Previn continued the Mac@IBM conversation by saying the upfront cost of PCs is lower, but the residual value of Mac is higher. “A Mac still has value three or four years down the road,” he added. With the provisioning and automation practices used to manage Mac, IBM does not need to create images for all of their machines — saving their IT staff significant time. And the fact that they’re supporting all of the devices and users with a minimal number of IT staff is truly incredible. Previn says that Gartner believes the optimal number of IT to employees should be 1:70. Previn noted that the average is 1:242. And IBM is currently hovering around 1:5,400 for their Mac support. Wow! “We just need a lot fewer people to support these machines,” he added. *This blog post was updated on October 27, 2015.